Unknown to most travelers, Taytay boats some of the best islands in Palawan. Located on the north-eastern coast of Palawan, the islands of Taytay bay are the perfect private escape. Taytay known as “Estrella Del Norte” which means “The Star of the North” in English is one of Palawan’s oldest municipalities and was also the first ever capital city of the province. With an area of 1,257.68 km2 (485.59 sq mi) Taytay is the largest municipality of the province and the first capital of Palawan. The population of Taytay in the 2015 census was 75,16563. Its people, from the original Palawans, Tagbanuas, and other cultural groups live in harmony, making this place a cultural melting pot. The nearest airport is Lio El Nido but it is very small and has limited flights. The biggest airport Puerto Princesa is located about 4-hour drive. There are daily shuttle vans that run from El Nido to Taytay & from Puerto Princesa to Taytay. There is an ATM machine at the BPI Bank in Taytay town proper. In Taytay, credit cards or debits cards are often not accepted, except at the hotels/resorts. The Philippines has the lowest internet speed among the countries in South East Asia, so when you to travel to remote places such as Taytay, don’t expect much. The hotels in Taytay provide free wireless internet, but sometimes connection is really slow. Top tourists attractions in Taytay are: Spanish Fort and Apulit Island. The average length-of-stay in Taytay is 4 days. Elephant Island: White sand beach and excellent snorkeling. The island has a natural, hidden lagoon tucked deep within the cliffs. Isla Blanca: an outstanding island with along coral white sandbar and a vast coral garden. long coral white sandbar dotted by coconut trees. Fort Santa Isabel: a 17th-century Spanish fortress with a lot of history and great views. It was built to protect the inhabitants from the attack of the pirates. Manguao Lake: also known as Lake Danao, is the only freshwater lake in Palawan mainland home to over 100 different species of bird, perfect for bird watching enthusiasts. Taytay can be visited all year round. The dry season, from November until May, is characterised by sunny days with calm seas and blue skies. The dry season is usually considered the high season. The wet season is from June to October. -Public Transportation: Shuttle vans and public buses make a stop at the Taytay Bus Terminal on their way to El Nido. Taytay port (if you proceed to Apulit) and Taytay town proper are only 5-minute tricycle ride from the Bus Terminal. Shuttle vans between Puerto Princesa and El Nido are daily and run almost every hour from 6.00am until 6.00pm. The journey from Puerto Princesa to Taytay usually takes around 5 hours. -Private Transfer: Private van is the quickest and least hassle way to get from Puerto Princesa to Taytay. -Public Transportation: With no direct link between Sabang to Taytay, shuttle vans are via Salvation Junction. Get Lexxus shuttle van that goes to Puerto Princesa and ask to be dropped at Salvation, where you can catch the connecting shuttle van or bus to Taytay. The journey is about 5 hours, plus the stop in Salvation. -Private Transfer: Private van is the quickest and least hassle way to get from Sabang to Taytay. Public Transportation: Shuttle vans make a stop at the Taytay Bus Terminal on their way to Puerto Princesa. Cherry Bus and Roro Bus run regularly between El Nido and Taytay. Shuttle vans and Buses between El Nido and Taytay are daily and run almost every hour from 6.00am until 6.00pm. The journey from El Nido to Taytay usually takes around 1 hours. -Public Transportation: Recaro Shuttle Van on the way to El Nido can drop you at Taytay Terminal upon request. The journey from Port Barton to Taytay usually take around 3 hours. 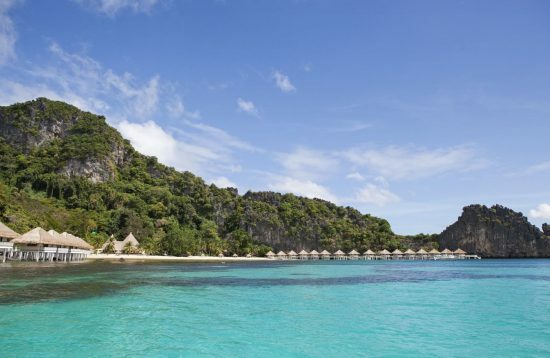 The tour package 7-day El Nido and Taytay combine two popular island resorts: Miniloc Island in Bacuit Bay in El Nido and Apulit Island in Taytay Bay. The most exclusive resorts are located on the islands, while in the downtown there are only a couple of pensions. Casa Rosa in Taytay town is a budget accommodation with a unique location on top of a hill overlooking the Spanish fort and the bay. Casa Rosa is well known for its restaurant that serves amazing dishes. 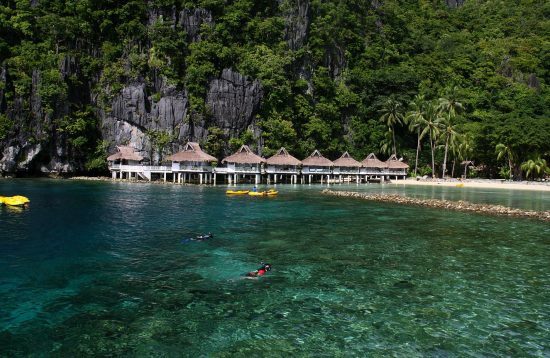 Apulit Island Resort sets on the private island is one of the most exclusive resorts in Palawan. The resorts features unique cottages designed in traditional Filipino décor built on stilts above the sea. NoaNoa is a tropical island with coral reef teeming with marine life. During select periods it’s possible to rent the entire island to yourself. Flower Island Resort is a hidden retreat with 20 bungalows set amid tropical vegetation, white sand beaches, and azure waters. Each cottage is made of natural local materials to evoke a touch of rustic luxury.